Hi and welcome! Today's card was made for four different challenges - CAS(E) This Sketch, Merry Monday, the Freestyle challenge at MFT's Creative Olympics and The Male Room. On a panel of Bristol Smooth cardstock I blended a mix of Distress Inks and Distress Oxide inks in an ombre fashion. Once that was done, I went over the panel again - this time with the Drifts & Hills stencil and the Mini Cloud Edges stencil. I then spritzed some water over the panel and set it aside to dry. 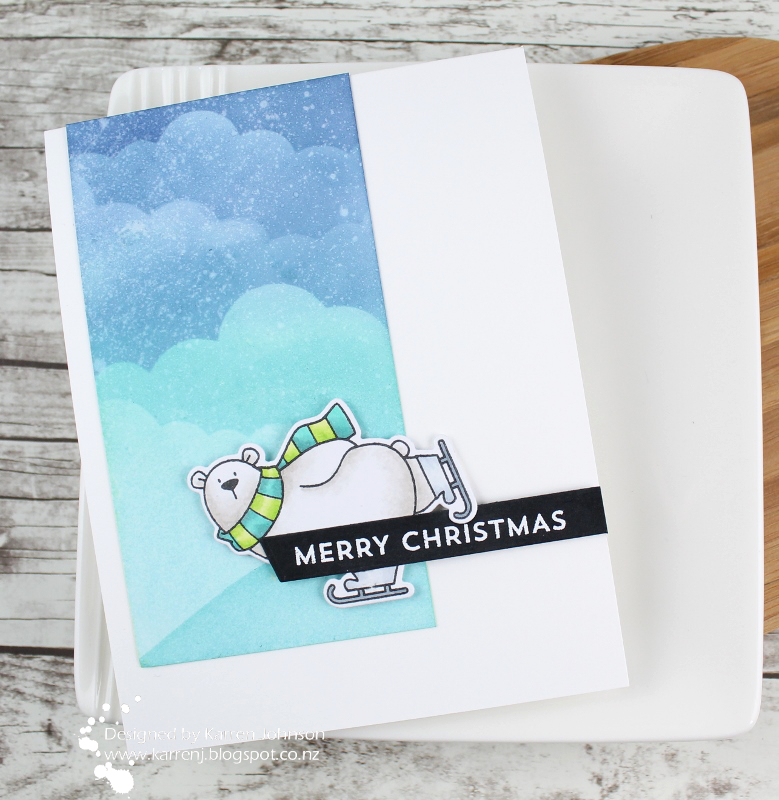 The polar bear was stamped onto X-Press It cardstock and colored with Copics. After die-cutting it, I arranged it with a white-embossed sentiment and adhered it with foam tape onto the sponged panel. Both layers were then added to a white top-folding card base. Great way to use the stencils Karren, wonderful Christmas card. Thanks for sharing at Merry Monday. Nice ombre background - I like how the skate peeks over the banner! Thanks for playing with us at The Male Room Challenge Blog! 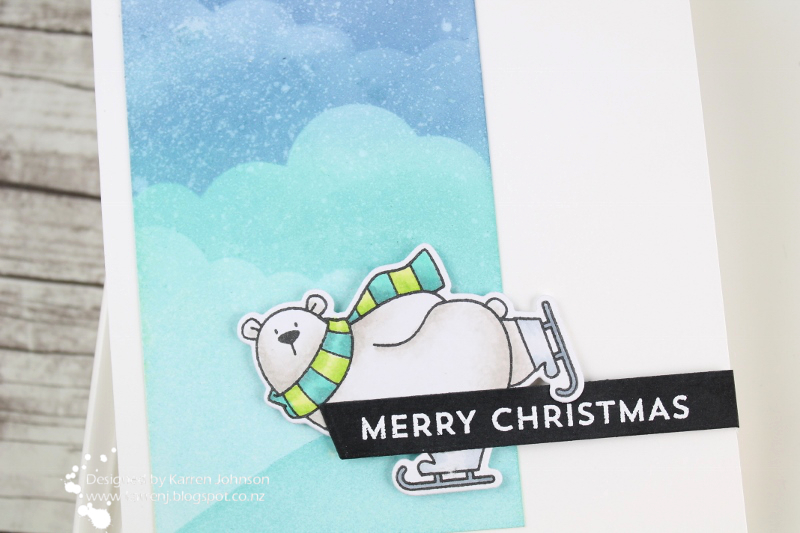 Nice ard, I love that polar bear on skates. Love that cute bear and gorgeous inked sky on the vertical panel. 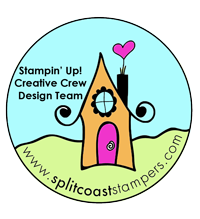 Terrific card Karren! You do such an amazing job combining challenges, Karren! I love your stenciled panel with this really fun bear...especially how you hooked his ice skates over the sentiment...so clever and fun! LOVE this card! This is absolutely darling! Great job! Thanks for joining us this week at Merry Monday! Love your take on the sketch using my fave polar bear! Congrats on your HM shout out at CTS! 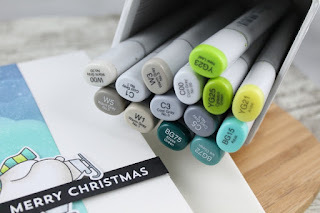 Adorable~ The colours are so soft and delicate, just like a winter snowscape! Oh, this is so cute! I love the inked background and that guy skating (I fall over!!). 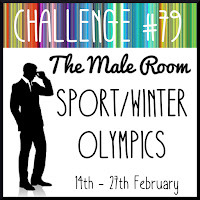 Thanks so much for playing along with our Winter Olympics/Sports theme at The Male Room. Deborah, DT. Beautiful card you made :-)) Great skater.